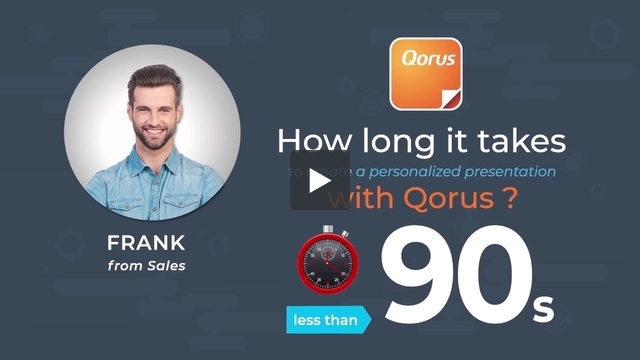 With the Qorus Cart, you can re-use slides from different presentations and assemble them into a brand new personalized presentation. You can assemble new presentations using any of the Qorus Add-ins, as well as from Hub Central. Once you've added your first slides to the cart, a new bar will appear in your add-ins. Here, you can see how many slides (or items) there are in your cart, you can manage your cart by clicking on 'Checkout', or you can clear all the items in your cart by clicking on 'Clear'. Before we proceed to the checkout, let's add a few more slides from another presentation. Instead of adding an entire presentation to the cart, you can choose which slides you'd like to add from the Preview. While you're in the Cart Contents window (click on the 'Checkout' button in the Search pane to bring this up), you can select slides by clicking on them. The information you provide in this form will be used by Qorus to instantly personalize the new presentation you're assembling. Smart Fields do an 'auto find and replace', getting rid of placeholder text and personalizing it with real customer information you provide in the form. Smart Rules are essentially 'show / hide' rules, which when evaluated based on the information provided in the form, will auto-adapt the inserted content for the business context. To learn about how to design Smart Fields and Rules and add them to your documents, click here. 2. Next, you'll be asked whether the new presentation should be created in its original format (in this case PowerPoint), or if the new document should be created as a PDF. Here we've selected the PDF option. 3. If you check the box 'Save this document', Qorus will save the document to the location you specify. If you choose not to check the box 'Save this document', Qorus will skip the step of saving it to your Office 365, and will go straight to giving you the option to download the new file and open it on your desktop.